The Ortiz family is being evicted from their home to make way for a luxury "micro-apartment" complex in Logan Square. LOGAN SQUARE — Tenants who are being evicted from a building on California Avenue to make way for a "micro-apartment" luxury development are demanding that their Jan. 15 move-out date be pushed back, saying they need more time to find replacement affordable housing in the neighborhood. But the landlord contends that he's given the tenants plenty of time to find new homes. In December, a judge ordered the tenants to move out by Jan. 15. But the tenants who live at the proposed development site, 2328 N. California Ave. and the developer behind the 138-unit apartment project, Savoy Development, recently negotiated a new relocation agreement. Under the new agreement, the move-out date would be pushed back from Jan. 15 to March 1 to give the families more time to find affordable new homes, the families would each get $2,500 and back rent and the landlord, Francisco Macias, would be reimbursed for court costs, attorney fees and rent he couldn't collect during the eviction process, according to tenant organizers. "I feel upset because my kids are little. 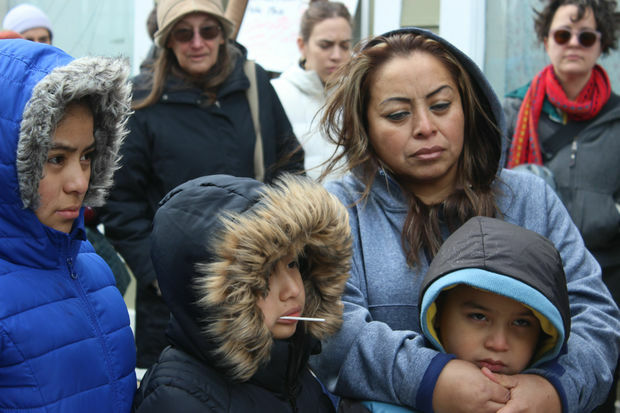 We are going to be without anything," said Glenda Ortiz, whose family is being evicted from the Logan Square building after living there for 11 years. "I want more time because of the weather and it's not easy right now to find a house with a low price." But Macias, and his attorney who are handling the eviction, are refusing to comply with the new agreement. Macias argues that tenants have had six months to find new homes and the new agreement is merely a stall tactic. "They already agreed to [Jan. 15]. Why are they doing this two weeks before? They signed this agreement in court," Macias said. "I've followed every policy the city has for the eviction process. Now we're talking six months later and they still don't want to leave after false promises." The tenant organizers allege that Macias won't grant the extension because the property needs to be vacant by a certain date or else the sale to Savoy will fall through. But Macias said his unwillingness to negotiate "has nothing to do with the development." "I look like the bad guy, but these people have not paid rent since July. I have to pay my taxes," Macias said. "I have a family. There's thousands of dollars that I'm losing because they're choosing not to move." Given the prolonged eviction process, Macias said now there's a chance the deal with Savoy will indeed fall through. But that doesn't mean the tenants can stay. "Whether I sell the property or don't sell the property, I can't continue renting apartments there for $500 a month," he said. Ortiz and three of her four children led a news conference Saturday morning organized by the Autonomous Tenants Union and Somos Logan Square. 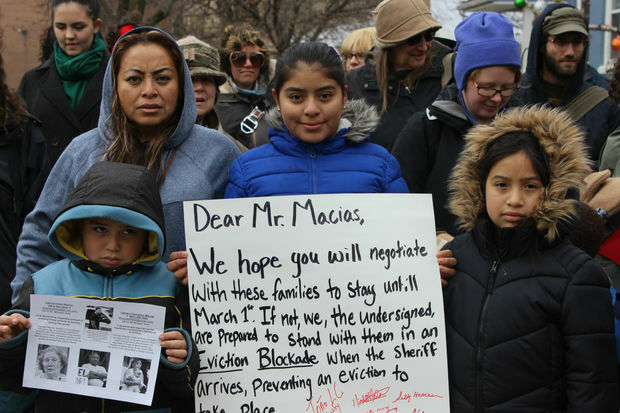 Armed with a poster board letter addressed to Macias, the Ortiz family and a few dozen tenant organizers and protesters marched to what they thought was the home of Macias to demand a "fair" relocation agreement. Upon arrival, the group realized Macias does not live at the address. Moving forward, the tenants and protesters are threatening to form an eviction blockade if Macias remains unwilling to negotiate. The organizers described the blockade as "a non-violent tactic which Chicagoans have successfully used before to prevent Sheriff evictions." Macias, who has lived in Logan Square for more than 30 years, said he "doesn't care" if the tenants form a blockade. "What about the poor landlord? He's getting screwed and no one seems concerned about it," he said. Savoy received approval from the City Council to build the 138-unit apartment project on the site in June. The proposal calls for 138 "micro-apartments," including $1,200 studios offering an average of 439 square feet of space and $1,400 one-bedrooms offering an average of 537 square feet of space. The original plan for the site was to build 52 units, but after receiving approval by the city's Plan Commission in March 2015, the developer came back to the community with an expanded plan for the now 138-unit project. The Ortiz family is one of three families that still live at the proposed development site. The other three families that lived there have already moved out. The site is also home to a car wash.
Enrico Plati, founding principal of Savoy Development, told DNAinfo in September that he hopes to break ground on the project by the end of 2017 and move residents in by early 2018. Plati didn't immediately return a a message seeking comment Saturday.